I’m thrilled and honored to be the first blog to publish this piece! 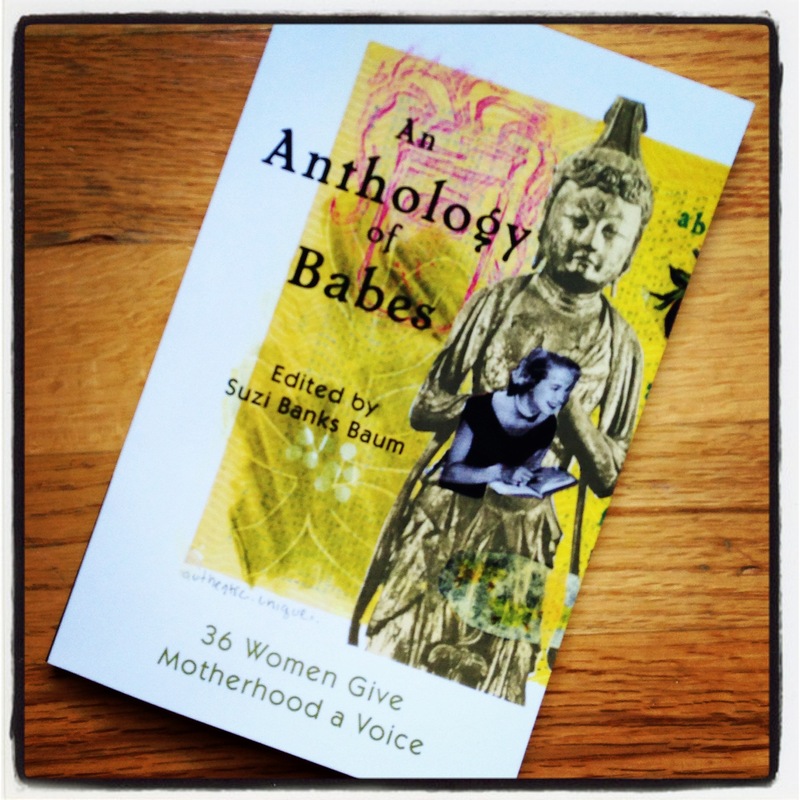 Suzi Banks Baum, writer, artist, and blogger, recently released a book that belongs in the hands of every creative mother: An Anthology of Babes: 36 Women Give Motherhood a Voice. (Suzi’s wisdom also appears in my e-book The Creative Mother’s Guide: Six Creative Practices for the Early Years, so you may have already met her in those pages — or here at Studio Mothers.) 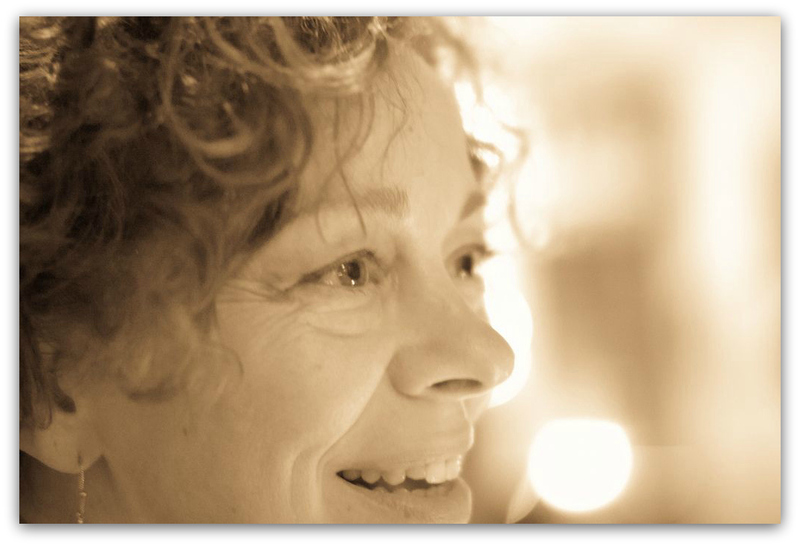 In the piece below, Suzi shares the journey that resulted in her book, addressing the doubts, obstacles, and beauty that accompany the creation of anything worthwhile. Savor Suzi’s words, and please consider supporting her work by acquiring a copy of the book. Vulnerable is exactly how I felt when I invited 35 women to jump into the freezing-cold waters of public opinion and share themselves and their perspectives on living lives pumped full with creativity in Anthology of Babes: 36 Women Give Motherhood a Voice. At that point I knew wanted to put my words and images out in to the world, but publishing a book? Being that public terrified me. So, I figured I’d rather have some co-conspirators. Standing before a literary agent is much like any other moment in life when you are Dorothy at the feet of the Wizard. “Is there anything in your bag for me?” “Could there be another human aside from my best friends who might be interested in my writing?” Standing there, knees clattering (and go ahead, tell me I was supposed to own my brilliance, stand for all mothers, flirt with the agent, shine shine shine), palms slick with sweat, lips dry, eyes blurring, I learned I was to go home and build my author platform. “Come back when you’ve built that,” said the agent. With help, I built the website. I studied social media, which until that point I barely knew. Facebook was the Shangri-La of my budding teenagers, not a place where I’d hang a photo of my soup or myself. But I studied and built and like Noah, two by two, found my way to hundreds of blog posts in five years and a sweet tribe of people who comment occasionally, and who I gift as often as I can with giveaways and good news, with poetry, art, and stories. And I discovered something. While I warmed up my writing voice with blog posts, there were other women out there, mothers, writers, artists, women making things with their hands and minds that I could connect to and stand near to gather warmth and wisdom. I liked this. A lot. My author platform had come to life. It was time for the next step. With a nonfiction book, after you’ve developed your author platform it’s time for your book proposal, which becomes your calling card to literary agents. A nonfiction book proposal has a sample of your writing, a summary of the book, your bio (eeekkkk) and all the thinking and writing you’ve done to establish that there’s a market for your book. I embarked on a relationship with a coach to assist me in writing my book proposal for Laundry Line Divine: A Wild Soul Book for Mothers. Stephanie Gunning asked me to invest in my work not only with time and energy, but tuition for her program. She urged me to attend writing conferences to expand my writing community. This was no small undertaking, and the effort, when you aren’t generating any income from this work, requires a helluva lot of courage and faith that yes, there is something you are heading towards and it is a place for your words in the world. I conceived Out of the Mouths of Babes: An Evening of Mothers Reading to Others because I knew there were other women like me, writing from the perspective of being a woman who is a mother, who creates from this place and hopes to affect change in the world, to bring joy, cake recipes, solutions to global warming, and other such things through their work as creative people. I proposed the event to Dr. Jennifer Browdy de Hernandez, director of the Berkshire Festival of Women Writers. In March 2012, I produced the event to a standing-room-only audience. I think the bedtime snacks drew a few in, but I know it was the potential magic of the writers I invited that made the room swell with people. An Anthology of Babes: 36 Women Give Motherhood a Voice was borne into the world from the hope brewed in the hearts of women who cannot but express themselves; women who daily ask if they could possibly continue living their lives without this expression, because after all, wouldn’t it all be easier? Dinner would be whipped up on time, thank-you notes would go out right after the party, and socks would match day after day if only we did not feel compelled to express ourselves as the wind is compelled to blow, as the seas to wave, and as the apple to ripen. We are women pressed to express. This urge exists no matter what our life conditions. Every single strata of our culture bears the blaze of women’s creative expression. On my own path to expressing my voice, I learned that I am equally compelled to add oxygen to that fire and build it up, celebrate those flames and raise the value of the voices of creative women. The stories they tell from inside motherhood bring light to places our culture has never cozied up to. These stories are news from a territory of human life populated by tired people who have not seen evidence that what they have to say is either captivating or newsworthy. What I discovered in telling my stories and hearing the stories of others is that the ensuing comfort and inspiration waft like smoke signals to a world craving stories and storytellers. In the beginning, I thought the book might be An Anthology of Babes: 20 Women Give Motherhood a Voice. But the response was stronger than I’d expected. So my title went from 20 Women Giving Motherhood a Voice, to 25, to 30, then 31, 32 and hovered at 35 until I had that one last post to complete the set. Thirty-six seems like such an abundant gathering of anything. I will take 36 peaches any day. Or 36 buttons. Or 36 stories of how women sew together lives rich with children, projects, businesses, and yearning. At this moment in time, I have neither a literary agent nor a book deal. My nonfiction book proposal for Laundry Line Divine: A Wild Soul Book for Mothers simply waits for the moment in time when I feel I have populated my author platform with enough material to justify interest in my work. I am establishing a place, my place, this place for my words in the world. My author platform is now busy with activity as I peddle An Anthology of Babes to local bookstores, libraries, and the ever-present behemoth of Amazon. But, the blessings of the Anthology are that I am becoming savvy in the ways of marketing, I hear readers respond to writing and what they want to hear more of. It is confounding at times to find a 10- or 15-minute span of time where all these wants and needs and rotting peaches on the counter settle and you can close a door, any door, but a door and write, doodle, read, rest, paint, knit, or whatever rings your chimes that counts for self-expression. Given the bus rides between two jobs, counseling your kids through witnessing life in America, shutting off the voices of self-judgment, containing the flood of input our culture serves us daily: all of these things clutter the on-ramp to quiet time. I have long advocated and will likely go to my grave promoting the idea that the very act of being alive is creative, and the sooner we agree that the acts of magic performed filling the lunch bags or organizing a fund drive or negotiating work hours and sitter coverage are all works worthy of value and appreciation. Long ago we were convinced that our daily lives are drudgery and only the things we do that are away from daily life are sublime. We swallowed the belief that nothing sacred or transformative happens in daily life, particularly with kids. I differ with this. Slow is the new slogan. Slow food, slow art, slow time. Many artists today are tuning themselves to slow down and pay closer attention to their lives as a source for inspiration. Most mothers can tell you stories about slow. They have slow covered. They learned about slow when they watched their newborn see a sibling for the first time, the tracing of face, eyes, and smile that moved between subject and virgin observer. Most mothers know much about slow, having stood at the edges of puddles with toddlers. Or with six-year-olds eating cake. Or with seven-year-olds at the beach in a sandcastle construction project. Mothers know slow. And only in slow can the revelatory insight of inspiration come that all we have to be today is awake and beauty worth describing flows all around us. I discovered slow while sitting in a pool of impatience early in my son’s life. We were visiting my mother-in-law in Florida. She lived in a place with many pools, designed for visits from the grandkids. My son was just a few months old. I was eternally tired and somewhat shocked at the reality of being a stay-at-home parent. My husband and his family took hours discussing, then debating, and then making plans. I was murdering them all in my head as I saw window after window of time when I could get a break from the baby close as I waited for them to decide what we’d do next. They were not debating big life decisions. This was where to eat lunch. So, to preserve what shreds of sanity I could, I strolled my dozing baby out under the palms near a quiet pool to wait for the debate to produce a result I could eat. I sat there. Looked at my sweet kid. Looked at the mothers and in-laws in the distance, playing in blue waters with noodles and balls and squirting fish. The air was ripe with sunblock. Without much thought, I reached in to my diaper bag and pulled out the sketchbook I kept there. Out of long habit, I used these little books to make notes, keep lists, and doodle. I set my eyes on the top of a trunk of a date palm in front of me and let my eyes trace the thready mass there. Shapes emerged that I had never noticed. I began to draw what I saw. And the heat in my chest, the impatience with what seemed to me to be an eternal ceaseless debate over nothing much but which stalled any momentum I had on that day, all of that stilled as I drew the palm tree. I felt grace enter my world. This act of drawing pulled me in to an inner shelter where ease and resilience were restored. God, I found out, was in the details. I let myself do this again and again. When my kid napped, I would doodle or sketch or read, and my attention to my new life as a mother shifted. As my son sought his thumb to self-soothe, I found that small breaks to slow down and attend to what was in front of me left me refreshed. This is the stuff of daily life. Material abounds when we raise the value of mothering from drudgery to playground. The struggle we all experience to express during the fulltime job of raising children can beat us to the typewriter or sketchpad. It can trip us en route to the studio. It can undermine us because of fashion failure, bad hair days, and the long recipe of low self-esteem invented by too little time for self-care. So we don’t write, we don’t shed light on our dreams, and we deprive the world of our value because we ourselves have not experienced that value. We have not made even a tiny step towards our dreams because we are too tired and weary and downtrodden. For some, we feel there are no resources available for our art. The time is just too sparse. The climate where you live may not be conducive for you to be slow in any way. Survival may simply be all you can manage. I hear you. I see you hanging on by a thread. I have lived this close to the edge, skated the urgency of need. My mother raised my sisters and I in the chaos wrought by the alcoholism of another family member that took a stark toll on our daily life. I was hardly aware of it at the time, but in retrospect, I see all the habits in me of living a life where security and safety used to be in short supply. I was the oldest child in what we’d call today an at risk family. You may find this proposition of celebrating the toil of your daily life as anything other than agony preposterous beyond belief. I have found comfort in scratching out a few words every day before sleep. Three loved things about the day. Three things noticed. Three things that sustained. This form of gratitude provides handholds up and over the Himalayan hurdles that mothers clear daily. Grace comes into the cracks, wets tears, and allows rest when you begin to see the niggling presence of beauty in your life. It could be as simple as writing one postcard a week to someone. It’s a connection with a thought that builds creative fire with tinder-sized slips of paper. So, that is why I invited all those women to share. I could be vulnerable in the company of others. I was convinced by my friend Jan that, “if she could, then I could.” So, it is 36 women and the number grows weekly on the blog series at my website Laundry Line Divine. Please read the book. Share it if you like. And consider your stories. Yes, this invitation to be vulnerable will feel very much like your regular life, once you get started. Your life can fuel your paintings. Your birthday cakes are works of art that will lead to more works of art. Art that is every day and in every way sublime because it is your passionate expression of what it is to be you, in this life, not waiting for a certain state of perfection to arrive so you can don a certain outfit and then become an artist. Writer after writer in the blog series reveal the vulnerability that has birthed courage, joy and transformation in their lives. They may not desire to birth books, but in claiming their voices they begin to revitalize their lives, they become as Miranda Hersey says in her piece, “a more spacious self, a more generous mother-heart.” Whether or not the world accepts their works of art, these women have discovered their own value. And it is this value born from vulnerability that leads to a well-built platform, if not for an author, then simply for an authentically happy human being. Congratulations! Thanks for sharing part of your journey.